CAMP DRACULA, Iraq¡ - Romanian paratroopers in 495th Infantry Battalion patrol 200 km daily in the Dhi Qar province of Iraq. The 495th is named after "Capt. Stefan Soverth," a Romanian paratrooper who did not accept the Russia suppression of Romanian paratroopers in 1945. 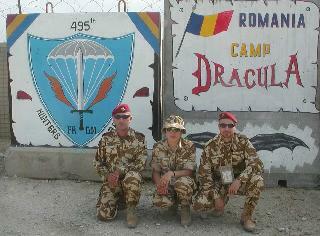 Camp Dracula, a walled compound inside Logistical Support Area (LSA) Adder, is very close to the ancient city of Ur. Nasariyah is the Iraqi City that closest to the base. 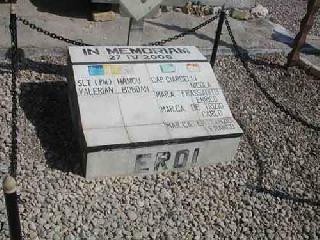 Romania is supporter of the war on terror and also has a large presence in Kandahar, Afghanistan. In Iraq, the Romanian Area of Operations (AO) is the entire Dhi Qar province - over 12,900 square kilometers, of which they patrol daily. "We secure, patrol and do reconnaissance missions," said Lt. Col. George Constantin, the Battalion Commander. He said that they also secure the bridge over the Euphrates. This bridge is the only one in 200 km to cross the river. These paratroopers have a six month tour of Iraq. They also help protect LSA Adder. Constantin said that they have not had any trouble lately. 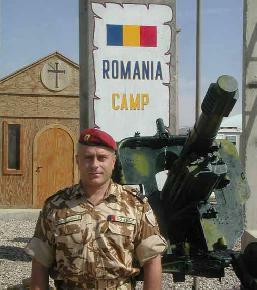 In October 2006, Romania took over this mission from the Italians, who have for the most part, withdrawn from Iraq. In the new year of 2007, the 495th Battalion arrived in Iraq, replacing the previous battalion. To help the Iraqi people, the Romanians are also working on school project. The school has six classrooms. I hope it will be completed while we are here, Constantin said of the school. This is the first time that Constantin and his battalion are in Iraq. "I like it very much," he said. "We feel very very good." Constantin's battalion has received no casualties. Since their involvement in Iraq, Romania has lost only one soldier. A stone memorializing that soldier and Italian causalities is within Camp Dracula. According to the press packet given to me by the Romanian's, Vlad Draculea was born in 1431 and was of the lineage of a Knight of the Dragon's Order, who stopped the Turks from advancing into Europe. The 495th Battalion is from Bucharest, which is near Vlad's kingdom. Lt. Col. George Constantin, the Battalion Commander. The Bram Stroker Dracula is a fictionalized version of a real historical figure that the Romanian's look back on. It is after the Romanian Hero, not the fictionalized character that the camp is named. In the last couple of years Romania has had very high temperatures 40 to 50 degrees Celsius, Constantin said. These high temperatures back home have made it an easy transition for the paratroopers to Iraq. Romania's military is all volunteer. One tradition the Romanian's have upheld is their religion, even in war. More than that, they build amazing churches. In Kandahar the Romanian's have an exquisite church. In Iraq, they have a portable church. To see the wonderful murals and hear the Father Preda Bogdan talk, please look at the youtube video. I had a chance to interview three paratroopers stationed at Camp Dracula. A platoon commander, 2nd Lt. Andrei Mihai Oancea, a squad leader, Master Sgt. Daniel Oancea and a team leader, Sgt. Lizuca Darie. All of them said that they enjoyed the work that they were doing in Iraq. Unfortunately, I do not speak Romanian, so these interviews were all through an interpretor. 2nd Lt. Andrei Mihai said that his platoon guards the bridge. The program varies, but spends he and his paratroopers often spend a few days at a time there. The mission is difficult, he said, but we are trained for this. Sgt. Lizuca Darie said the schedule at first was hard to get used to, but now she is doing well and enjoys her work, knowing it benefits the Iraqi people. Master Sgt. Daniel Oancea works on the Quick Reaction Force. If there is a threat any where outside the wire with a Romanian patrol, such an attack, he is one of the paratroopers on team that responds to help. With our background and training, I consider that this is a normal mission, Oancea said. The coalition forces he works with, he said, he considers comrades and is proud of his work.